Many cities around the rim of the Indian Ocean became fabulously wealthy during the middle ages through the medieval Indian Ocean trade routes. The Swahili coast of Africa had ivory, gold, ebony, sandalwood, and slaves to trade. China had silk and porcelain to get to market in the west. India, at the center of the trade routes got it coming and going, silk from China and ivory and ebony from Africa, and they exported their spices and narcotics. Many city rulers, like the sultan of Aden at the mouth of the Red Sea, demanded tribute for merchant ships to stop in the port. It was the Arabs mostly who were the sailors and traders, braving the pirates, storms, and hardships of life at sea to become wealthy off their buying and selling. This is a lateen rigged ship of the type that would ahve been seen in the Indian Ocean in the middle ages. African, Arab, and Indian fisherman and sometimes pirates still sail them. They were fairly small and usually hugged the coast like most sailing ships of the day. Image by Pearson Scott Foresman, released to the public domain. Along with moving goods the Arabs moved much of their culture and religion around the Indian Ocean as well. If you wanted to be up and coming in the business world you learned to write and speak Arabic and you at least pretended to accept the religion of Islam. In time much of east Africa, Persia, and Indonesia did accept Islam in truth, though India and China with their already highly developed and cultured lifestyles did not for the most part. Print out this Indian Ocean Trade Game from Layers of Learning. The cities of the East Coast of Africa benefited under the prosperity of Arab trade in particular. Their language developed out of a blend of the native Bantu tongue and Arabic. They became a literate and refined people, devoted to learning. The leisure brought by wealth and the access to outside knowledge brought by trade meant that they became more cosmopolitan and learned than their European counterparts of the same period. They also had the wealth to build larger, more beautiful cities of stone. Their diets began to include the flavors of India and their beliefs the influences of Islam. Print out the map above by clicking on the link or on the image. You can free-hand draw the map onto a large poster board and make it into a simple game. Just roll a die to travel from Sofala, the southernmost Swahili trade city to the Spice Islands and back. Use any little pieces for game pieces. Force (wink) the kids to listen to facts about the Indian Trade, the Arab traders, or the Swahili city-states between turns. You’ll notice pirates on the map. These spots really were pirate havens back then and captains of trading vessels were especially cautious as they neared these areas, though a pirate could set upon you anyplace. 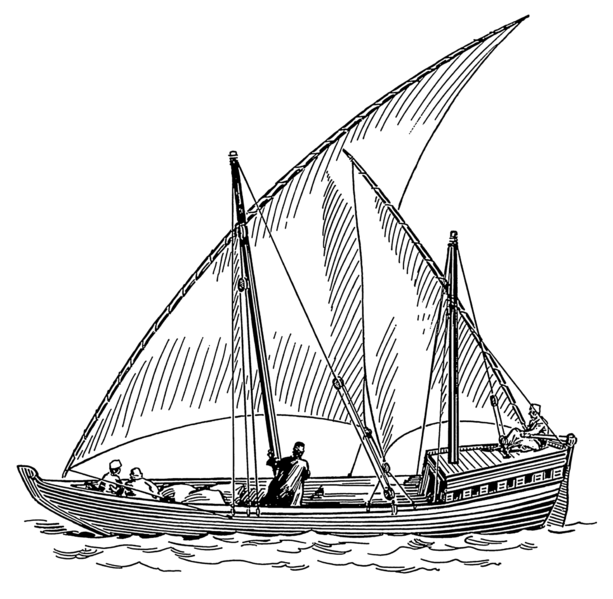 Learn about the dhow boats used by the Arabs. Pirates were all over the Indian Ocean, but there were certain places that were especially favorable to pirates. If you were a pirate what would you look for in a good hideout or base of operations? Learn about the foreign African Slave Trade. It actually started with the Arab traders, hundreds of years before the Europeans even “discovered” sub-Saharan Africa. Ormuz was one of the main slave trading ports. The Island of Madagascar has some of the most unique and fabulous wildlife of anyplace on Earth. Learn more about the animals and plants found there. This map activity is from Unit 2-13 of the Layers of Learning curriculum.